Before :- V.K. Shali, J.
Crl. M.C. 2550 of 2011. D/d. 2.1.2012. For the Petitioner :- Mr. Siddharth Luthra, Sr. Adv. with Mr. Gaurav Gaur and Mr. Rupesh Yashpreet, Advocates. For the Respondent :- Mr. Navin Sharma, APP. Mr. Shailiendra Babbar with Mr. Joginder Sukhija, Advocates. Gobarbhai Naranbhai Singla Vs. State of Gujrat & Ors. 2008 (3) SCC 775. Kalyan Chand Sarkar Vs. Rajesh Ranjan @ Pappu Yadav & Anr. 2004 Crl. J. 1796. Puran Vs. Rambilas & Anr. 2001 (2) JCC 31: 2001 (6) SCC 338. Raj Kumar vs. State (NCT of Delhi) 128 (2006) DLT 264. Siddharam Satlingappa Mhetre Vs. State of Maharashtra & Ors. 2011 (XII) AD SC 340. Yogender Partap Singh Vs. State 2009 (2) JCC 1314. V.K. Shali, J. - This is a petition, filed under section 482 read with Section 439(2) Cr.P.C. for setting aside the order dated 01.08.2011 passed by the learned Additional Sessions judge, Dwarka Courts, New Delhi regarding granting of anticipatory bail to the respondents. 2. Briefly stated, the facts of the case are that a case FIR No.30/2010, under section 302/307/34/147/ 148/323/325 IPC read with section 25/27 of the Arms Act was registered at P.S. Dabri, New Delhi, on the statement of Sh.Vivek Gaur, s/o Sh.Virender Kumar Sharma, R/o C-25, New Krishna Park, Vikas Puri. He had stated that he, along with his family, has been residing at the above given address and is running a factory of manufacturing scooter parts at Khasra No.38, Village Dabri, New Delhi. On 2.4.01.2010, at about 9.30/10 am Haryana Police came to Dabri, Delhi in connection with the investigation of case FIR No.2/2010, under section 380/342/147/148/448/506/511 IPC, registered by PS Manesar, District Gurgaon, Haryana, at the instance of one Sameer Gaur s/o Late Sh. R.K. Naseem. The Haryana Police had apprehended three accused persons from the factory of one Vinod Sharma, uncle of the complainant, which was also located in the same Khasra No.38, Dabri Village, New Delhi. At about 11 am, Vinod Sharma, his son Aman Gaur, the present petitioner and his driver Amrit Lai came to the spot. Neeraj, Rahul, Naresh Karotia, Sunita w/o Ram Mehar Singh, who were employees of Vinod Sharma also came to the spot. Thereafter, it is alleged that Vinod Sharma, his son Aman Gaur, the present petitioner and his workers created riotous situation. Sunita w/o Ram Mehar Singh and another worker of Vinod Sharma Laxman brought lathis (big sticks) from inside the factory. Sh. R.K.Naseem, a noted lawyer, who. is the uncle (Phoofaji) of the complainant had also come there and he had tried to pacify both the parties. It is alleged that when Sh.R.K.Naseem stood at one side, facing the factory of Vinod Sharma with his back, Vinod Sharma took a lathi (a wooden plank) and hit it on the head of Sh.R.K.Naseem from the back, with an intention to kill him. As a consequence of this, Sh. R.K. Naseem fell down and became unconscious. Aman Gaur, the present petitioner, is alleged to have taken out a revolver and fired three rounds with an intention to kill Sh. Raji v. Gaur and others but there was a narrow escape and nobody got injured. It is alleged that Aman Gaur threatened to kill while firing towards Sh. Rajiv Gaur and others. It is alleged that Neeraj, Ramesh Raghav, Kailash Khati, Naresh Karotia, Rahul and Amrit Lal belonging to the group of Vinod Sharma attacked the complainant's brothers, namely, Sunny and Monty with the help of sticks (danda) and fists. 3. On the basis of the aforesaid information, the FIR was registered. Sh.R.K.Naseem was admitted to the hospital, where he succumbed to his injuries after a few days without gaining consciousness. The offence of section 302 was sub-sequently added to the FIR. 4. So far as the bail granted to Naresh Karotia, Amrit Lal and Laxman by the learned Additional Sessions Judge on 01.08.2011 is concerned, I have heard the learned senior counsel Mr. Siddharth Luthra for the petitioner and Mr.Shailendra Babbar on behalf of the respondents/accused. "it is to be kept in mind that a concept of setting aside unjustified, illegal and perverse order is totally different from the concept of cancellation of the bail on the ground that the accused has misconducted himself." "21. Undoubtedly the allegations against the applicants, are very serious in nature as they are stated to be members of an unlawful assembly. the common object of which was to kill the deceased and he was ultimately killed. It is the case of the prosecution itself that whatever happened at the spot on 21.1.2010 between 10 am to 11.30 am has been recorded by a CCTV camera, the footage of which has been downloaded in three DVDs of 30 minutes duration each and filed along with the charge sheet. These DVDs were viewed in the courtroom by me on 26.7.2011 in presence of the learned counsel for applicants, Id. Special Prosecutor and 10 of the case, who had made available the DVD player and the LCD Screen. The prosecution claims this CCTV footage as a crucial evidence in this case and indeed it is. It is aptly said that men may lie but the circumstances do not lie. The aforesaid CCTV footage provides a clear glimpse of the circumstances in which the incident happened. It is important to note that these three DVDs were handed over to the police by Sandeep Sharma @ Sunny s/o Late Sh.Ajay Sharma in presence of Rajiv Gaur s/o late R.K.Naseem and were seized vide seizure memo dated 05.2.2010 by 10 Ashok Sharma of Crime Branch. 22. Applicant Naresh Karotiya is nowhere seen in the footage during the whole incident. The charge sheet even does not mention anywhere the presence of this applicant on the spot of incident. The absence of applicant Naresh in the CCTV footage was admitted by the Id. Prosecutor when the same was viewed in Court. 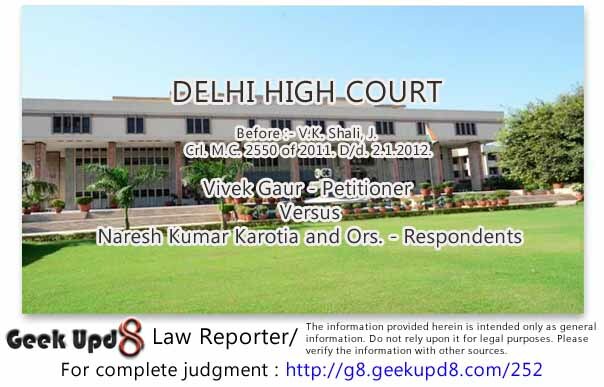 This contradicts the statement of the complainant Vivek Gaur (on the basis of which FIR has been registered in this case) where it is stated that this applicant was present at the spot and he along with Nceraj, Ramesh, Raghav, Kailash Khati, Rahul and Amrit Lal beat Sandeep Sharma @ Sunny and Deepak Gaur @ Monty with fists and dandas. Even if the said statement of the complainant is taken on its face value, dehors the CCTV footage, then also it nowhere shows that the applicants Naresh Karotiya and Amrit Lal did any act relating to the death of R.K.Naseem. At the most, it discloses commission of offences u/s 323 IPC and 325 IPC, both of which are bail-able. 23. It was argued by id. Prosecutor that even if the three applicants did not do any such individual incriminating act, yet they are vicariously liable for the death of deceased Petitioner. R.K.Naseem as they were Members of un-lawful assembly, the object of which was to kill Mr.Naseem. At this stage. after viewing the DVDs and scrutinizing the charge sheet, statements of complainant and other eye witnesses, it does not appear so. The complainant in his statement has, though, stated that accused Vinod Sharma and his driver Amrit Lai, on reaching the spot, were joined by Neeraj, Rahul, Naresh Karotiya and wife of Ram Mehar Singh and all of them started creating ruckus, CCTV footage shows that situation was otherwise. Accused Vinod Sharma and Aman Gaur raach the spot at 10.56 am. They meet the SHO P.S. Dabri, who was still present there, and show him certain papers, which according to Id. Counsel Shailender Babbar, were their anticipatory bail papers in Manesar case. A verbal altercation takes place between Vivek Gaur and Vinod Sharma. Vivek Gaur is seen shouting angrily on Vinod Sharma and then head buts him. Vinod Sharma is thrown a few paces back and hits his car which was parked nearby. Amrit Lal and Sunita try to save Vinod Sharma but Amrit Lal is also beaten. New who creates ruckus? Where is the so called unlawful assembly allegedly formed by the accused and applicants? Who is the aggressor in the first place? Answers are self evident. Deceased Petitioner. R. K.Naseem was present at the spot. However, no person from accused's side touches him. Thereafter, peace prevails till 11.15 am except occasional outbursts of the rival factions. 24. At about 11.15 am scuffle again takes place between the two parties. At this juncture Amrit Lal and Laxman seen coming out of their factor with 'dandas' in their hands. However. they do not indulge in any unlawful act. Accused Vinod Sharma is seen snatching the 'danda' from the hands of Laxman and hitting on the head of the deceased Petitioner. R.K.Naseem. Here I am not examining the role of either accused Vinod Sharma or his son Aman Guar. I am explaining this only to examine what role, if any, has been done by the applicants in the incident." 7. As against this, Mr. Shailiendra Babbar, the learned counsel for the respondents has contended that the learned Additional Sessions judge has rightly exercised its judicial discretion of granting anticipatory bail by forming prima facie view of the matter on the basis of the evidence which has been adduced by the prosecution at the stage of investigation. It was also contended by him that the respondents have already been on bail from 01.08.2011 and even if it is assumed for the sake of argument that the discretion was not properly exercised, even then, the fact of the matter remains that today despite being on bail for a period of almost five months, they have neither misused their liberty nor created any conditions which may be conducive to the fair investigation or holding of a fair trial. Therefore, these subsequent developments are very important considerations for passing any order as on date with regard to the legality of the order dated 01.08.2011. 8. I have carefully considered the submissions made by the learned counsel for the parties. 9. I feel that there is some amount of merit in the contention raised by the learned counsel for the petitioner that exercise of discretion by the learned Additional Sessions Judge while granting anticipatory bail to the three of the respondents on 01.08.2011, was not proper and justified. The reasons for holding the said view by this Court are as follows: (i) Firstly, this was a case admittedly where the accusations against the respondents were very serious in nature in as much as allegations were made by Vivek Gaur/petitioner in his complaint that these three respondents were part of the unlawful assembly and in furtherance of their common object caused death of Pandit R. K. Naseem who was a noted criminal lawyer in Delhi. The offence of murder is the most heinous crime and more so when a member of the legal fraternity was the victim. The punishment for such an offence is life imprisonment or even death sentence. If these were the allegations against the respondents then certainly the first parameter is the severity of the allegations against the respondents which goes against them. The question which would arise is as to whether there was any prima facie evidence in this regard against the respondents or not. Admittedly, the complainant had taken their names. It is also a well settled law that while considering the question of grant of bail the Court does not have to conduct a meticulous dissection of evidence so as to find out as to whether the persons were part of the unlawful assembly or not, and if so, what was their role in the said unlawful assembly which had gathered in furtherance to their common object. And if this dissection had to be done, it is only for a purpose of a prima facie view to be formed by the Court and for the purpose of deciding the bail application and it should not tantamount to forming an opinion on the merits of the case. On all these parameters, I feel that if the order of the learned Additional Sessions Judge is read in its entirety, especially paragraph nos. 21 to 24, which have been reproduced hereinabove, it clearly shows that although the learned Addl. Sessions Judge has correctly appreciated the pronouncement of the Supreme Court, but he has mis-applied the law to the facts of the present case. The learned Additional Sessions Judge has done minute dissection of the evidence and raised the queries on his own and answered them and literally decided that the respondents were not the part of the unlawful assembly, and even if they were the part of the unlawful assembly the offence which at best could be made out against them is the one under Section 323 and 325 IPC. The Learned Additional Sessions Judge has gone to the extent of saying that 'analysis of the whole material on record' shows that there is no evidence to connect the killing of the deceased or of any other heinous crime. The Learned Additional Sessions Judge has not even cared to mention that the expression of any opinion may not be treated as an expression on the merits of the case and, therefore, it almost decided the allegations against the respondent on merits, while deciding his bail application. While deciding the bail application of the accused persons with reference to the allegations leveled against him in respect of a particular offence, it does not warrant the observations that the offence under different sections or a lesser offence is made out. The impugned order is giving impression as if the learned Additional Sessions Judge was deciding the question of framing charges against the respondents. This, I feel, will cause serious prejudice to the petitioner. Such stark observations passed by the learned Special Judge are not only against the pronouncement of the Supreme Court but also have potential to cause a serious prejudice to one of the parties. This is against the fundamental principle to be observed while deciding the bail application. Reliance in this regard is placed in case titled Gobarbhai Naranbhai Singla Vs. State of Gujrat & Ors. 2008 (3) SCC 775. (ii) The second reason as to why the learned Special judge seems to have gone wrong is that admittedly this was not in dispute that on four earlier occasions, the prosecution had taken the plea that their application for grant of anticipatory bail had been rejected. The learned Special Judge had rightly noted that in case titled Yogender Partap Singh Vs. State 2009 (2) JCC 1314, the Apex Court has rightly observed that merely because an accused is declared a proclaimed offender does not take away his right to apply for anticipatory bail. The learned Special Judge had also relied upon the judgment of the Apex Court in case titled Siddharam Satlingappa Mhetre Vs. State of Maharashtra & Ors. 2011 (XII) AD SC 340 wherein broad principles for grant of bail had been recapitulated and it has been observed that the personal liberty of an accused is the most valuable thing and it should not be permitted to be jeopardized by false and frivolous accusations. The two anticipatory bail applications were withdrawn, and therefore, they could not be treated as dismissal of the anticipatory bail application on merits and even if the one which was decided on merits was not treated as an application dealing with the points on merits which were sought to be urged before the learned Additional Sessions Judge, I am of the view that in case such a reasoning is given then it will only open pandora's box and give unlimited number of opportunities to an accused to file repeated applications by observing that earlier anticipatory bail application was not decided on merits. This Court in case titled Raj Kumar vs. State (NCT of Delhi) 128 (2006) DLT 264 has also observed that it is a common knowledge that when an application for grant of anticipatory bail is filed and argued by the counsel then after sensing that the Court is not in favour of granting bail, the counsel makes a statement seeking permission to withdraw the petition, which permission as a matter of routine is granted by the Courts. But certainly, only on account of the fact that reasons for rejection of the bail do not apparently get recorded does not mean that the withdrawal of the application of the petitioner was for want of non-consideration of his bail application on merits. In the instant case, this had happened admittedly as there was withdrawal of application at least on two occasions. It was contended by the learned counsel for the respondents that the application was withdrawn to be filed before the appropriate Court, where trial was pending. If benefit of this submission is given, even then at least on one occasion the application was withdrawn after being argued which would be treated as rejection on merits. 10. So far as the third anticipatory bail application which has been considered by the learned Additional Sessions Judge is concerned, it has been observed that this application purported to have been rejected on merits can also not be treated as rejection on merits because the reasons are not given with regard to the evidence against the respondents. 11. I feel that such a reasoning given by the learned Additional Sessions Judge is fraught with danger, in as much as, every time an anticipatory bail application is rejected and it does not deal with a particular aspect of the matter which may not have been urged, though available. This will give rise to an occasion of filing of the successive bail applications on the said grounds before another Bench, for the purpose of reconsideration and will result only in Bench hunting by an unscrupulous accused. The fact of the matter in the instant case is that if not on four occasions at ]east on three occasions the anticipatory bail was either dismissed or withdrawn. 12. The power of grant of anticipatory bail has been conferred by the Code of Criminal Procedure, concurrently, on the Sessions Court and the High Court. Normally, as a matter of fact, the practice which is prevalent in Delhi is that an accused is first relegated to file a petition before the Sessions Court and after having done so, if he is unable to get the requisite relief, he files a second anticipatory bail application before the High Court which is considered by way of judicial review, in as much as, it reconsiders not only the order passed by the learned Sessions Court but also independently assess the facts as to whether the accused person, in the given case, is entitled to grant of bail or not. Once these two opportunities are utilized by an accused and he is unsuccessful, ordinarily, the accused must submit to the processes of law. The law does not countenance that a person who fails to avail the protection of law files successive/repeated anticipatory bail applications, get them rejected and yet does not submit to the processes of law, and thereafter. sits on the fence observing the proceedings and then suddenly resurfaces after the charge sheet has been filed and applies to the Court for grant of anticipatory hail. 13. This is precisely what has happened in the instant case. The respondents anticipatory bail applications were rejected earlier three or four times after which they ought to have submitted to the processes of law. Normally, a person who seeks protection of law must submit to the processes of law. On the contrary, the respondents were declared proclaimed offenders after their anticipatory hail application having been rejected. Certainly, a person declared as a proclaimed offender may not be denied the benefit of anticipatory bail in all circumstances. A distinction has to be made where a person has been declared as a proclaimed offender without his knowledge and cases where a person knows about his being required by law enforcing agency yet tries to escape from the same by hook or by crook and then suddenly finds an opportune time to obtain an order to insulate his liberty. Such a benefit conferred on this kind of unscrupulous accused persons, in my view, is a disservice to the law. I feel that the learned Additional Sessions Judge, in the instant case, by granting the benefit of anticipatory bail to the respondents, has not exercised his discretion judiciously and properly as they were declared as proclaimed offenders and their application for anticipatory bail had been rejected. 14. Having said so now the necessary consequence of such an observation would normally be the cancellation of the order passed by the learned Additional Sessions Judge or either arrest respondents/accused or give them a protection that they must surrender before the Court concerned. It is also observed by the Courts in different circumstances that if the interim bail is granted to an accused person on couple of occasions and the same has not been misused by him then it would certainly be a valid consideration for grant of regular bail in respect of a serious offence, but in a case of a heinous crime like the present one, it may not be at all the one of the considerations. Reliance in this regard has been placed on case titled Gobarbhai Naranbhai Singla Vs. State of Gujrat & Ors. 2008 (3) SCC 775. 15. Though the subsequent facts may not be conclusive in deciding the validity of an order of bail, but these facts do become important because ultimately cancellation order impairs the liberty of a person. I am also of the view that the subsequent facts may have some impact on validity of the cancellation order, because with the lapse of time, in case the respondent whose anticipatory bail application was sought to be cancelled and who does not create conditions so as to threaten either fair investigation or fair trial or in other words, has not misused his liberty, then it may be a valid consideration for not putting him necessarily in judicial custody as a matter of punishment. But this will again vary from the case to case and further there can be no person better than the trial Judge to appreciate this. Thus, keeping in view the aforesaid points, I feel that the interest of justice would be sub-served in case the order dated 01.08.2011 passed by the learned Additional Sessions Judge is set aside by exercising the powers of the Court under Section 482 read with section 439 (2) Cr.P.C. and the respondents/accused herein are directed to appear before the learned Special Judge within a period of two weeks from today and file an appropriate application for grant of regular bail. The respondents shall not he taken into custody till their regular bail application is decided by the Court afresh on merits after taking into consideration all the facts and circumstances of the case germane to the grant of regular bail. Ordered accordingly. The learned Special Judge shall not get influenced, in any manner whatsoever, by the observations passed by this Court hereinabove, as these are only tentative views formed by this Court for deciding the present petition wherein the order dated 01.08.2011 is assailed. With these directions, the petition stands disposed of.